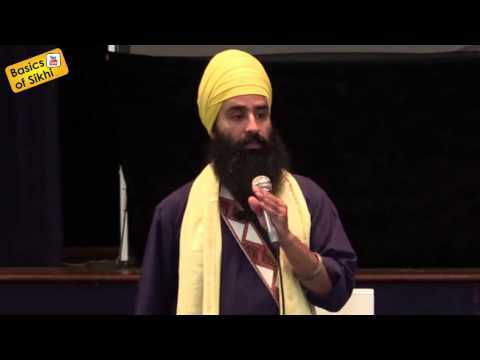 What is Sikhi’s view of other religions? “Of all religions, the best religion is to chant the Name of the Lord and maintain pure conduct. Sikhism defines God as love, but love that is not limited only to Sikhs, while excluding others, such as Muslims, Hindus, Jews, or Christians, among others. If God is love then to be furious in the name of religion is to be truly irreligious. Toynbee, the celebrated historian, was perhaps the most prominent western observer to note that the two great religious systems of the world – Vedantic and the Semitic – met in Northern Indian in the fertile plains of Punjab. Their interaction spawned a new people – the Sikhs – with a new philosophy and new world view. In the five hundred years of Sikhism there have been many a debate on the Vedantic roots of Sikhism and also on its Semitic antecedents which came via Islam. There is also a second, powerful argument which holds that, to look at Sikhism as a synthesis is to diminish it, for it is an entirely new revealed system. But that discussion is not pertinent here. What is important is that if the philosophers of both Hindu and Islamic traditions have sought to include Sikhs in their own world-view, it is because they have seen something admirable in Sikhism with which they can identify. And that makes a nice starting point for a discussion of inter-religious tolerance in the Sikh perspective. What I wish to emphasize is that a recognition of the diversity of human belief, and tolerance of the variety of human behaviour, have permeated Sikh teaching and practice for its entire existence. Through much of their history, in the many battles that the Sikhs fought for survival, many of the enemies were Muslim because the ruling government of the day was Muslim, other enemies were Hindu. Many of the friends and allies of the Sikhs in those battles were Muslims, others were Hindus. History tells us that during the time of Guru Gobind Singh when the Sikhs fought most of their battles, a Sikh, Bhai Kanhayya by name, had the job of ministering to the wounded in battle. Bhai Kanhayya did the job without distinguishing between friend and foe, for a wounded man was no longer an enemy. He was commended for this by the Guru. There can be no better example of commitment to the principles of religious tolerance and freedom of religion than that of Guru Tegh Bahadur. He willingly embraced martyrdom while defending the right of people other than Sikhs – the Hindus – to remain Hindus and not be converted against their will. History also tells us that in the past nine years, since 1984, many a gurdwara has been desecrated and many a volume of Sri Guru Granth Sahib Ji have been burnt or shot at by the enemies of the Sikhs. However, there has never been a documented case where Sikhs had desecrated a Hindu temple, the idols therein, or any mosque. There are no known instances throughout history till present day where a gurdwara has been built on the remains of a Hindu or a Muslim place of worship. This statement applies equally to churches or synagogues but I speak here only of temples and mosques because Islam, Hinduism and Sikhi were the only religions involved in the almost internecine conflict in the Punjab over many centuries. Even in these troubled times, Sikh Gurdwaras remain open to all, irrespective of religion, as they always have. The only requirements being that visitors remove their shoes and cover the head. The prayer that a Sikh reads every day ends with the plea for betterment of all mankind, not that of Sikhs alone to the exclusion of everyone else. To hate man and to worship God would be clearly contradictory and perverse, for religion teaches us that the ultimate reality of God is to be experienced through service to humanity and by accepting the diversity of His creation. « If all Paths are equal then why was the Sikh religion started?